Welcome to the Library and Information Division of AISAT. It was established in the year 2011, serves as a knowledge hub containing resources not only in the form of print but also in e-resources and provide students with access to a vast repository of resources, including books and Journals both print and online. College library is located in a spacious hall of the main building, A-block for all students and staff members and have to register at library for utilizing the facility. The Library reading space can accommodate more than 150 students. Entry and Exit in the library controlled through E-Gate. User identification can be done by smart card reader. In-time & out-time report of Student’s & staff can be tracked. Library functions such as Acquisition, Circulation, and Cataloguing have been automated using open source software- KOHA and DSPACE used for digital repository. The working hour is from 8.30 am. to 5.00 pm, on all working days. 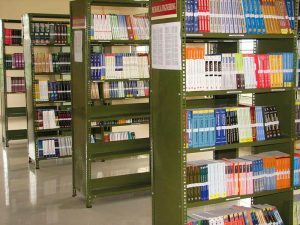 Collection of more than 11700 volumes of textbooks and reference books in over 2400 titles in all branches of engineering, science, technology, management and general studies are available. The titles are categorized into subject wise and branch wise. Open access system is followed in the library. Library is following the DDC (Dewey decimal classification) system for organizing the library resources. We are committed to provide value based education with ample opportunities for research and consultancy. We take every possible step to enhance the skills and bring out quality professionals, providing a friendly and growth oriented ambience with appropriate resources. We improve ourselves continuous evaluation and updation to meet the challenges and requirements. To be a centre of excellence for professional education and related services creating technically competent and ethically strong innovative minds committed to the overall growth of the nation and beyond. To provide organize and make available for use, a modern and rich set of specialized information to the beneficiaries at the appropriate time. To assist the beneficiaries in making the most use of the information they discover. To support research activities and programmes by offering proactive information services. To be recognized as a world class Engineering College Library that provides excellent learning materials timely and accurate information in various print and non-print formats. The resources of the Reference Section contains a sizeable reference collection for quick retrieval of information through dictionaries, handbooks, yearbooks, textbooks, reference books etc. in different spheres of knowledge. It is the policy of the AISAT Central Library to update these reference sources periodically. These books cannot be taken outside. To improve the academic performance of the students, a text book bank is also operated by the library. One set of popular text books on each subject is made available for the benefit of the students. The set of books can be kept by the student for one semester. The complete set of books is to be returned to the library after the concerned university examinations. The aim is to have at least one text book per subject to all students for a nominal reading charge. AISAT Central Library has started providing access to e-resources from April 2011. This service is available only at AISAT premises through IP based access. These e-journals links can be accessed through OPAC. The Central Library has developed an Institutional Digital Repository using open source software namely DSpace. The Institutional Digital Repository collects preserves and disseminates in digital format the Conference Proceedings, Project Reports, Newspaper clippings, Syllabus, Old question papers, etc. User education programme is conducted at the beginning of new academic year for enabling the users to use the Digital Library resources effectively. Library Staff is ready to assist users in using the digital repository. The repository can be accessed by clicking on the link below. Soft copies of previous year question papers of B. Tech/M. Tech. University Examinations are available online at DSpace Web Site. For accessing the same click on the Link given below. For the membership all students and staff members and have to register at library for utilizing the facility. All members are eligible to check out materials for home use, or for use in the library. To borrow books from the library you have to collect Library Membership form in the circulation counter. Books, if they are not reserved, can be renewed up to three times. The details required for renewal are Name or Accession number of the book. Newly arrived documents shall be displayed. Documents on display shall not be issued for a period of one week. However, advance booking for such books are entertained. Members can access Online databases, Free e-journals, Free e-books, Old question papers, Syllabus, etc., through DSpace Digital library. Members shall not bring personal belongings (bags, text books, files, printed materials etc.) into the library. Members may leave them at the property counter. Students should write their name, time of entry and exit in the Gate Register kept at the entrance of the Library. Members are requested to maintain absolute silence in and around the library. Reading halls are meant for individual study only. Members shall not engage in conversation (including subject discussions) in any part of the library so as to cause disturbance to any other reader. Members shall not write, damage or mark on any book/periodical belonging to the library. Users are not permitted to alter the arrangements of tables, chairs, etc., in the library. Keep the Library premises neat and tidy. The librarian reserves the right to suspend the membership of any member found misbehaving in the library. Books returning and issuing time is 8.30 am. to 5.30 pm. Books borrowed from the library shall be returned within the due date. Those who fail to do so will be liable to pay a fine of 1 per day per book for the first week of default and Rs.5 per book per day thereafter. If a book is not returned within 15 days from the due date, an amount decided by the Principal / Manager will be recovered. The members tearing pages of books/ stealing books will be suspended forthwith from using the library facilities and the Librarian will recommend further disciplinary action against them. Before getting the books issued, the students should check the status of the book condition, and if any pages are found to be missing, should inform the Librarian. At the time of returning, if pages are found missing in the book, the student should replace it with the latest edition of the book, otherwise an amount decided by the Principal / Manager will be recovered. Entire volume cost will be recovered for the document (lost/damaged) which is a part of multi volume/issue set. Members should return the books borrowed from the library before they proceed on a long period of leave (15 days or more) and obtain a `No due Certificate` from the library. Books, journals, other documents, library equipments, etc., should be handled with care. Students are requested to switch off the fans before leaving the library. Students shall strictly follow the instructions given by the librarian. We follow an open access system. Books arranged on Dewey Decimal Classification (DDC) System with KOHA. Separate section for Periodicals, News Papers, Book Bank, Project and SeminarReports etc. CC TV Surveillance to monitor the movements of users. The members have to fill up the registration form for becoming a member of the library. Download the membership form, fill up the details, attach photo and submit to the librarian.